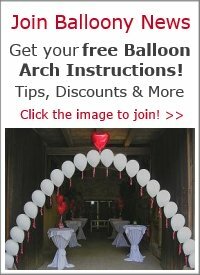 Your balloon decoration website is the best! 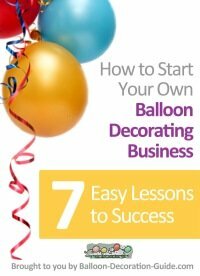 I have been on your website many of times and I think you guys are doing a terrific job helping people that want to get into the balloon decorating business or for people that are just doing for fun. You guys have a way of explaining things that is easy for everyone to understand. Here is my dilemma, recently I decided to take on a decoration project for my sister’s anniversary. As I was browsing the internet I found this beautiful table balloon centerpiece, but I have no idea on how to begin. It doesn’t look difficult and if I can get a starting point I’m sure I can do it. I have attached a picture. Please help! 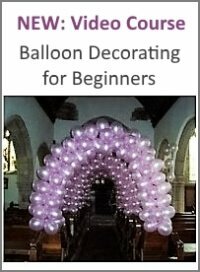 Thanks so much for your kind words about Balloon Decoration Guide. I am really glad that you find our information useful. I would suggest to use a cakeboard or styrofoam circle for the base. You can buy them online, for example at Amazon. Attach the ribbons, decor flowers and 5" balloons with either florist wire or glue dots to the base. Over at BalloonHQ.com I read that using 3M spray adhesive is great for gluing balloons together or to other objects. So you could try this for fixing the mylar balloon to the base. 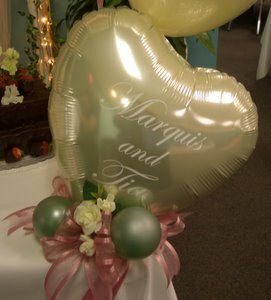 It's not quite clear from the picture if floating latex balloons are also part of the centerpiece. If so, you might want to fill one of the 5" balloons with water to give the base some more weight. Please let me know how it goes with your masterpiece! 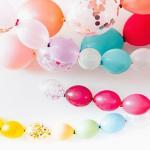 I'd love to see a photo of your finished balloon decoration.